How to tell who’s leaking what in the Trump administration. If the White House were anthropomorphic tableware (why not? ), it would be an extremely leaky, fractious teacup. There would be a tempest inside it. And if that’s too many metaphors for you, you’re also probably not crazy about the multitude of voices and perspectives that are, according to some people (but not all people) warring within the West Wing and then dribbling out to the rest of us in the form of disembodied mutterings. 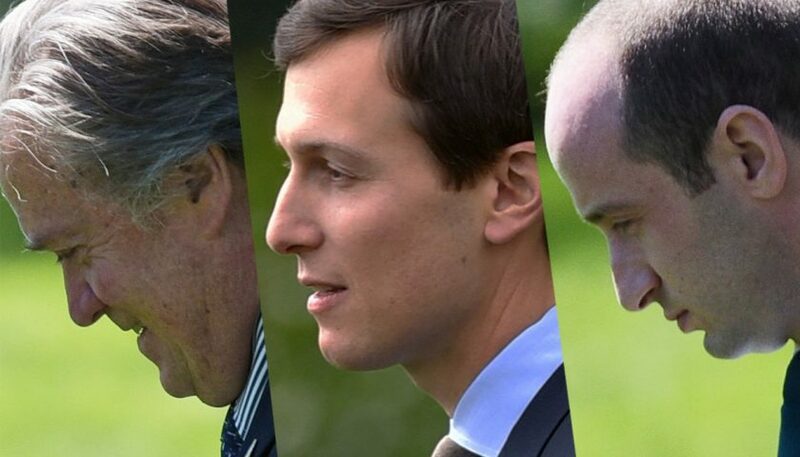 Donald Trump’s aides—the most high profile of whom are, at the moment I’m writing this sentence, Jared Kushner, Steve Bannon, Stephen Miller, Reince Priebus, and Ivanka Trump—famously bicker with each other, so much so that “the White House” is now a meaningless metonym. The Trump administration doesn’t speak with one voice. It talks over and around itself and up and down and sideways. When the White House is a set of anonymous-quote–spewing rival factions, you need to do some extra work to figure out where your news is coming from. How can you tell which Trump adviser delivered which unattributed comment? Follow along with us below, but be warned that we’re providing this information only on deep, deep background. Good news, beginners: A Bannon quote is pretty easy to spot. When he’s on the record, Trump’s bellicose chief strategist speaks in jargon befitting a student of ancient martial historians and fascist philosophers. He has vowed to fight for “the deconstruction of the administrative state.” He has invoked “Judeo-Christian values” as the answer to a “metastasizing” “Islamic fascist” movement. When Trump removed Bannon from the National Security Council in early April, Rosie Gray at the Atlanticreported that “a senior White House official cast the move as not a demotion for Bannon,” but as a strategic rearrangement of key pieces on the administration’s chess board. Bannon’s role on the committee, this source continued, was to “de-operationalize” the changes wrought by former National Security Adviser Susan Rice. “Job done,” the source told Gray. Sussing out that this “senior White House official” was Bannon himself would have been easy even if the Washington Post hadn’t lifted the veil of anonymity hours later. One tell was that the quote advanced a narrative favorable to Bannon, a guy who is not, shall we say, well-liked. The bigger signal was the source’s use of a conspiratorial, faux-intellectual, mostly nonsensical word. Reince Priebus has never de-operationalized anything in his life. Likewise, consider the line “You’ll see the setting of the predicate,” uttered anonymously to the New Yorker’s Ryan Lizza before the House Intelligence Committee held its first public hearing on Russian intervention in the election. The statement is confusing and arcane as a piece of rhetoric. It also presumes there’s some kind of deep tactical framework for what should be a straightforward procedure. That sounds a lot like Bannon. The gleeful pugnacity, the instinct for theater, the tendency to see the world in terms of grand contests, the references to film studios, the fact that this would make for a very bad movie—this is pure Bannon. The alternate theory, that the quote sprang from Trump himself, is undermined by its general coherence, its quasi-erudite titan metaphor, and the deployment of the word irony, which may not exist in Trump’s vocabulary. He [Bannon] is very talented at making himself seem the hero of the conservatives who elected Donald Trump … it’s a very smart thing to do on his part, but ultimately it’s not a sustainable strategy for him. The president sees through that kind of thing, and he’s aware of what’s happening … the reality is, if he keeps this up he’s not going to be here. It seems probable that Kushner or someone in his personal junta leaked to Politico that Bannon was not as accepting of his National Security Council eviction as he claimed publicly—that, in fact, megadonor Rebekah Mercer had to persuade him to stay on at the West Wing. Kushner may have also told the Times that Trump resented Bannon’s fanatical advocacy for the Muslim ban, a measure that became an early stain on the president’s record. We [the Trump administration] chose to hire a lot of alphas. People in politics are insecure and will either adapt to the fact that this is an entrepreneurial White House and survive, or they won’t. The cream will rise and the [expletive] will sink. Kushner “often talks about the presidency like it’s a business, describing it privately as ‘entrepreneurial’ and in ‘beta mode,’ ” according to Politico. He stands to benefit both from downplaying the palace intrigue and casting his (winning) side as the “cream.” And he can be ruthless, even coarse, behind closed doors. It is not the most Trumpian of statements. (It doesn’t mention his Electoral College victory once!) But we know it emanated from presidential lips because, despite Trump’s earlier instructions, the White House put his comments on the record later that day. In any case, closer inspection does reveal a few POTUS–y flourishes. When he’s feeling evasive, Trump likes to divest sentences of their subjects. There’s got to be a coming together. Of whom? How? As long as there is compromise. Between whom? Where? He tends to pair a strong statement with a slippery qualifier: The time is right … provided a 40-page rider of terms and conditions are agreed upon and met. Those terms and conditions are vague, too, and include weird redundancies: What kind of “compromise” doesn’t involve “both sides”? Also, watch out for the pseudonyms “John Baron” and “John Miller.” As the Washington Post reported in 2016, these factotums have miraculously appeared in the press to defend Trump’s business exploits and vaunt his romantic desirability. If someone named John is losing his mind in print about the president’s decision-making prowess, wealth, business achievements, and/or sexual conquests, it is probably our commander-in-chief. When a judge blocked the Trump administration’s first travel ban, Miller went on the record to express his displeasure. “The whole world will soon see that [the president’s power] will not be questioned,” he fumed on Face the Nation. Scary! Border control is Miller’s dearest concern, so any language in a White House notice on immigration probably emerged from his brain. These remarks are (stealthy) twins. They both ignore the technical nuances that inform judicial outcomes and exude a florid, unsophisticated patriotism. This is the work of a hyperconservative college-newspaper op-ed columnist, perhaps one who went to Duke. Shockingly, Priebus himself has served as a sub rosa informant: The Washington Post revealed in March that after Trump chewed out his aides in the Oval Office, the chief of staff spent an hour “calling reporters off the record to deny that the outburst actually happened.” Priebus failed in his mission and doesn’t appear to have been ventriloquized anonymously before the real story came to light. Perhaps that’s because he wasn’t telling the truth. Or maybe his quotes were so boring that even seasoned political journalists couldn’t stay awake long enough to transcribe them.